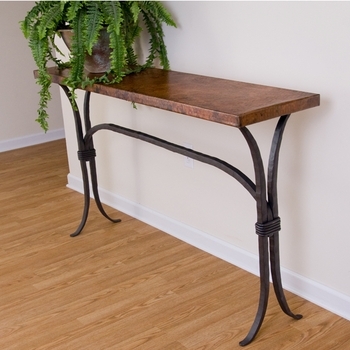 Sized to fit a 60" x 14" top, this sturdy iron table base will support glass, wood, copper, granite or marble. ~ Offering our tables as base only, allows you to use your own top or to select from a variety of tops to better match your decor. If you need a top for your table base take a look at our complete Console Tables or view our Table Top Collection. Dimensions: (Legs) 53"w x 12"d (Frame) 53"w x 12"d (Height) 32"h (Suggested Top) 60" x 14"